This lesson unit is intended to assess students’ understanding of the four quadrants of the coordinate plane, while at the same time introducing them to a mathematical understanding of slope. The task helps students to link their intuitive understandings of steepness to a more precise, calculated measure of slope. 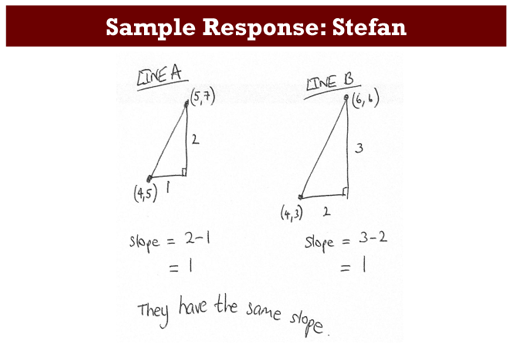 Before the lesson, students work individually on an assessment task, Steepness, which is designed to reveal their current understanding with regard to slope. You then review their work and create questions for students to answer in order to improve their solutions. In the lesson, students work in small groups on a collaborative task in which they put line segments into order of slope. They then examine some sample student work and critique the measures of slope used there. Then students try to construct a better measure of slope. In a follow-up lesson, students receive your comments on the assessment task and use these to attempt the similar task, approaching it with insights that they have gained from the lesson. Each student will need a copy of the task sheets Steepness and Steepness (revisited) and a Grid Paper sheet. Each small group of students will need copies of the cut-up Card Set, the four Sample Responses to Discuss, and some squared paper. Have protractors, tracing paper, and squared paper or graph paper available on request.